Has anyone tried IMR 4895 or any of the coarser powders in a Dillon powder measure? How consistent was the results? I have had very consistent results loading CFE.223 Varget and Benchmark in the Dillon measure. I have been reloading .223 on a single stage press using a Hornady Lock And Load measure. The Hornady measure is pretty consistent with IMR4895 plus or minus .1 grains. Now that I have a load worked up I would like to load up a few hundred on the 550 Dillon. "...plus or minus .1 grain..." Isn't accurate enough. .1 is enough to go from an inch group to an inch and a half or more. However, IMR4895 is one of the most commonly used powders. It's used in a horde of rifle calibres. Especially common in .30-06. I don't have a Dillon measure, but if it meters Varget well, it should do at least alright with IMR4895. I just measured some Varget, and the kernels were each 0.058" long. The 4895 ranged from 0.050 to 0.100 in length, but probably averaged about 0.080"
It was also a little thicker than Varget, but not by much. Maybe a little more binding, I'm not sure. Please follow up and let us know how it goes. I finally got around to loading some .223 in the Dillon 550 press with IMR 4895. I took a clean and primed .223 case and ran it through the powder die and measured the results. low and one out of twenty would be .2 grains low. I never experienced any binding. have a big effect on accuracy. and the six inch plate eight out of ten times. I think that is good enough to get the job done. Don't agree that .1 gr. would make a great difference in overall group size. Your scale can vary that amount during loading especially if you are using a digital scale. I have loaded thousands of rounds especially in .223 and try to get every load perfect but for 99.9999% of shooters .1 means nothing will be different. Remember if you are using a digital scale you might have .09gr more in any load that will not show up, same with a beam scale. In any rifle cal larger than .223 I weigh every single load attempting to get each exactly like the previous and know in reality I am wasting my time. I'm using 4895 (campro 55gr, AE x1 fired brass, federal 205 primers) in my XL650 and for me it's supposed to be throwing close to 25.5gr. I don't recall exactly how much deviation there has been (likely within the 0.1 grain level) though not enough for me to really worry as they were well within the safe tolerances for the load. The next time I'm loading up some rounds I'll mark down the powder throws and post them up. When I load some fresh cartridges I'll get some powder throws from them to see how they compare. I sat down the other day to make some rounds and here are the results I got for 37 measured rounds. I made 58 good rounds, 37 I scrapped due to primers not seating properly (these are the ones I measured), 5 ended up primed but powder spilled so I rejected them - these spilled powder ones are not included in the results below. 1- I only measured ones where the primer didn't seat properly. So the loads may be slightly off if any powder got stuck inside the case. 2- I had noticed in the past an issue where the numbers varied too much (like more than .1 grain... I could live with the difference between 25.42 or 25.60 from 25.50 that's fine... But 25.26 or 25.04? No way something is not right.) I'd heard that one reason for this was the blue knob on the powder measure failsafe return arm needed to be a bit tighter. So I tried tightening that up... But I found that it made things a bit too tight and had the tendency to not prime properly (wouldn't move up enough to prime fully) so I had to back it off through some trial and error. I'm still not satisfied it's at a good spot though. I had originally set the powder throw for 25.50 grains so that is what my baseline is supposed to be. The safe range for this projectile/powder is 25.00 to 26.00 grains. What bullet are you using in the mini14? 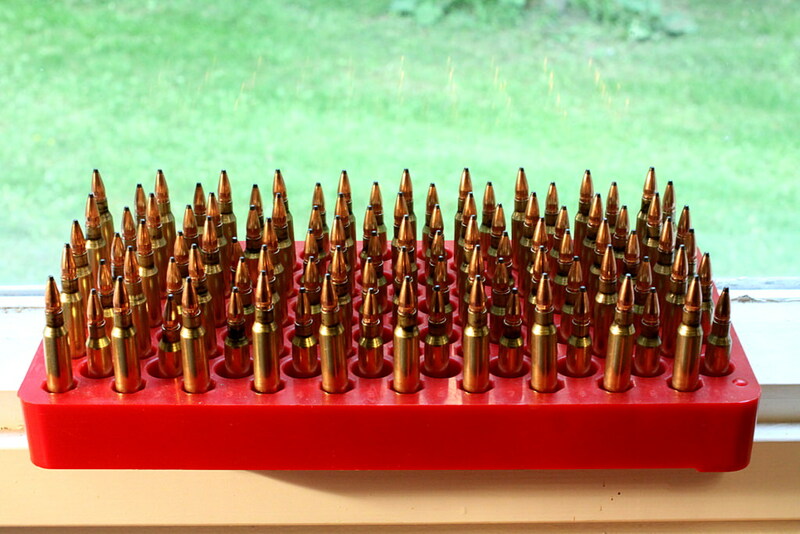 I am using 55 grain Hornady flat base bulk bullets.